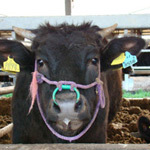 Nozaki Agricultural Production Cooperative specializes in fattening Kagoshima-raised Japanese Black cattle. Nozaki strives to achieve stable mass production of top-grade Japanese Black beef with a grade of 4 or higher. Nozaki-gyu was the first beef in Japan to bear the name of a person as a brand name. Of the cattle we raise with respect and affection using thorough fattening control, only those of Grade 4 (A-4, B-4) or higher*1 are stamped with the "Nozaki" brand name. Approximately 70% of the beef shipped by Nozaki is graded A-5. The grade of beef is divided into 15 classifications based on meat quality and yield. There are 3 yield grades A, B, and C.
Japanese beef is grade A. Other beef is often graded as B. There are 5 meat quality grades. The grade designation combines the above two types of grades to express the meat grade like A-5 or A-4. The highest grade of A-5 is reserved for select premium Japanese beef and at the Tokyo Meat Market, the largest in Japan, only about 20% of the meat is certified as A-5. The life of the cattle is a short 28 months. We want the cattle to be raised peacefully, leisurely, and healthily. 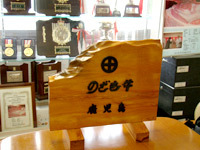 At Nozaki, all the staff members call the cattle ushi-san (Mr. Cattle) as an expression of our respect for the precious life of the cattle with which we are entrusted.